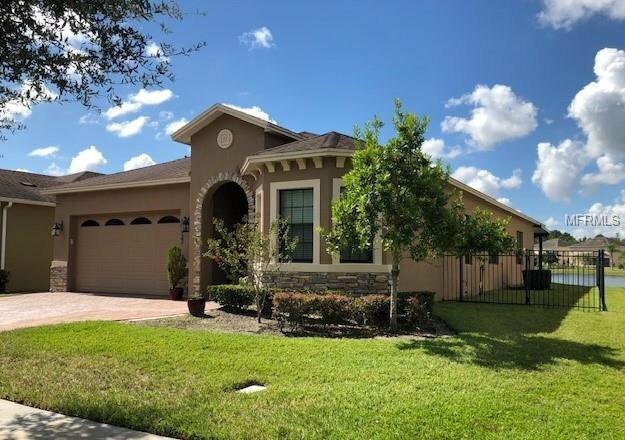 Beautiful and Comfortable 4 Bedrooms, 3 Bathrooms home located at Woodland Lake Preserve. Large Bedrooms with gorgeous Bamboo flooring and custom closets. The rest of the house has ceramic tile. Separate Formal Living and Dining room. Kitchen with 42 inch cabinets, solid surface counter tops, and stainless steel appliances. Fireplace is not included. Family room leads to large rear cover patio with awesome pond view. Property with fenced backyard. Water heater runs off individual solar panels. Home comes equipped with Bluetooth sprinklers system and Nest thermostat system. Seller is Motivated, come check it out! Listing courtesy of BROKERS REAL ESTATE GROUP INC. Selling Office: RE/MAX INNOVATION.